Growth mindset is a trendy topic these days, as more and more schools, parents, and businesses look for ways help their students and employees succeed. As a longtime fan of growth mindset, I’m thrilled about that. But I’m also concerned because I have now heard many well-intentioned people misinterpret growth mindset in critical ways (for a great article on growth mindset misconceptions, read Carol Dweck’s recent post in Education Week). At the most general level, a growth mindset is the belief that people can improve their abilities. It is contrasted against a fixed mindset — the belief that abilities are inborn and stable. People sometimes interpret growth mindset to mean that “effort is the only thing that matters.” But that’s not true. Fortunately, there’s an intuitive metaphor that helps explain the distinction. 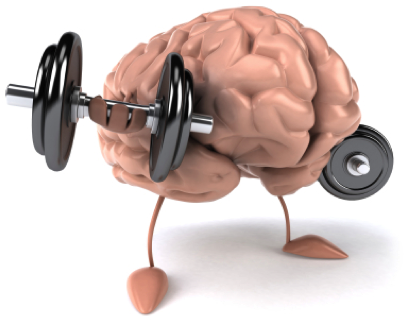 When explaining growth mindset, we often say “the brain is like a muscle” — meaning that you can strengthen it over time by training it in the proper ways. The muscle metaphor doesn’t imply that effort is the only thing that matters. If you’re trying to lift something that’s too heavy for you, you might simply not be strong enough to lift it, yet. Trying harder will result in strained muscles and burst blood vessels rather than increased strength. Instead, you may need to start with a smaller weight and go through a proper weight training regimen in order to work your way up to a higher weight. It takes effort, but it also takes time and the right strategies. In the same way, improving one’s mental abilities takes more than just mental effort in the moment: It takes effort over time, applied to good study strategies. When the teacher says, “you can do it if you just try harder”, a student might interpret it in a variety of harmful ways. He might hear, “you can do it if you just try harder [because you’re dumb, see how all these other kids got it already? ].” Or he might hear, “it doesn’t matter whether you’re using the right strategy to learn this problem. Just bear down and power through it.” That’s terrible advice if the student is already trying hard and actually needs to step back and think about a new strategy for the problem or ask for help identifying the right strategy. If he keeps struggling and failing despite his best efforts, he might walk away thinking that he shouldn’t trust his teacher or that he’s too hopeless to succeed even with herculean effort. To help students develop a growth mindset, focus on the fact that working through mental challenges strengthens the brain and, over time, improves their abilities. It’s not merely about success at a particular challenge in the moment (in fact, maybe they won’t succeed at the challenge in the short term despite their efforts, but those efforts could sharpen their abilities). Of course, understanding that you can develop your intellectual abilities by working hard won’t guarantee you’ll want to do so. There are many other facets to motivating students to challenge themselves and persevere through those challenges, but helping them understand that they can grow and that doing so takes time, effort, and good strategies is a great start. Dave Paunesku is the founder of PERTS, an applied research center at Stanford University that develops and tests learning mindset resources for educators and parents. If you’re interested in learning more about mindsets and practices that support them, visit www.mindsetkit.org. @pertslab Co-Founder and Director. I study the psychology of learning at Stanford University. Changing how students think about school to help them reach their full potential.